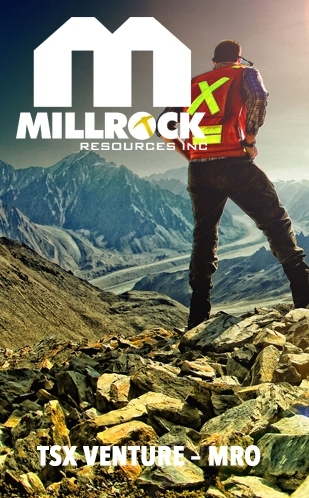 Vancouver, British Columbia, April 18, 2019 (TSX Venture: EMX; NYSE American: EMX) – EMX Royalty Corporation (the “Company” or “EMX”) is pleased to announce that it has received a US $2 million escrow distribution, which in addition to the initial US $65.15 million payment in 2018, brings the total cash paid to EMX to US $67.15 million from the sale of the Malmyzh project. A second distribution of up to US $2 million, subject to certain conditions, is due to EMX later in 2019 as remaining funds are released from escrow. Malmyzh was sold by IG Copper LLC (“IGC”) to Russian Copper Company for US $200 million in October 2018.1. IGC’s Malmyzh project was an important EMX strategic investment that exemplifies the portfolio effect of the Company’s diversified business model. Proceeds from the sale of Malmyzh, combined with ongoing royalty and pre-production payments, have yielded a robust balance sheet. EMX is utilizing this strong position to take advantage of new royalty generation, royalty acquisition, and investment opportunities to grow the portfolio and build shareholder value. About EMX. 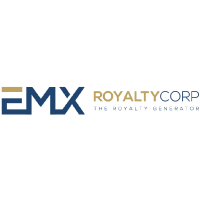 EMX is a precious and base metals royalty company. EMX’s investors are provided with discovery, development, and commodity price optionality, while limiting exposure to the risks inherent to operating companies. 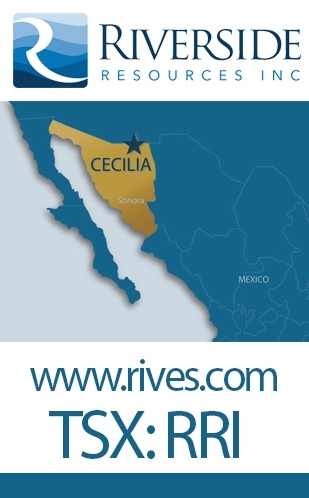 The Company’s common shares are listed on the TSX Venture Exchange and the NYSE American Exchange under the symbol EMX. Please see www.EMXroyalty.com for more information. Readers are cautioned not to place undue reliance on these forward-looking statements, which speak only as of the date of this news release or as of the date otherwise specifically indicated herein. Due to risks and uncertainties, including the risks and uncertainties identified in this news release, and other risk factors and forward-looking statements listed in the Company’s MD&A for the year ended December 31, 2018 (the “MD&A”), and the most recently filed Form 20-F for the year ended December 31, 2018, actual events may differ materially from current expectations. More information about the Company, including the MD&A, the 20-F and financial statements of the Company, is available on SEDAR at www.sedar.com and on the SEC’s EDGAR website at www.sec.gov. 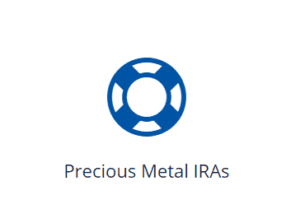 This entry was posted in Base Metals, Blog, Energy, Junior Mining, Precious Metals, Project Generators on April 18, 2019 by admin. VANCOUVER, British Columbia, April 16, 2019 (GLOBE NEWSWIRE) — Nevada Copper Corp. (TSX: NCU) (“Nevada Copper” or the “Company”) is pleased to announce the filing of a new technical report for its 100%-owned Pumpkin Hollow property near Yerington, Nevada (“Pumpkin Hollow” or the “Property”). 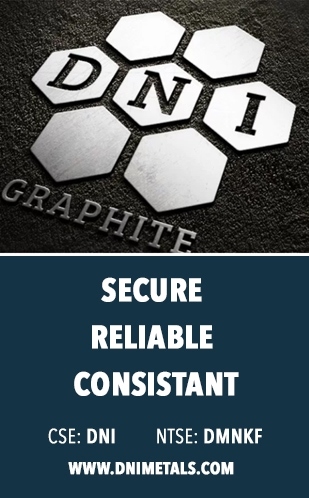 This technical report, entitled “NI 43-101 Technical Report: Nevada Copper Corp., Pumpkin Hollow Project, Open Pit and Underground Mine Prefeasibility Study (PFS)” (the “Technical Report”), has an effective date of January 21, 2019 and supersedes all previously filed technical reports for the Property. The Technical Report describes the Pumpkin Hollow Property and its advancement based on a phased development approach of the underground and open pit deposits as stand-alone projects. The Technical Report includes a pre-feasibility study for the stand-alone underground project (the “Underground Project”) initially completed in 2017, and a newly completed pre-feasibility study (the “Open Pit PFS”) for the open pit project (the “Open Pit Project”) at Pumpkin Hollow. The Underground Project is currently in construction, with initial production forecast for the end of 2019, while the Open Pit Project is in a study phase of development. Development options and timing of the Open Pit Project construction and operations remain flexible. The Open Pit PFS demonstrates enhanced economics for Nevada Copper’s Open Pit Project as Nevada Copper continues to advance the Open Pit Project towards an ultimate construction decision. The Open Pit PFS continues to apply the Company’s philosophy of phased development, and low-capital intensity growth. The Open Pit Project has all the material permits required for mine construction and operations. ° Combined Cu-eq production of 150,000 tonnes (330Mlbs) per annum at peak production. “We are very pleased with the new PFS for our Open Pit Project at Pumpkin Hollow. The results clearly illustrate the potential to put this large, open pit project into production with a further improved internal rate of return and continued low capital and operating costs. The 2018 completed drill program included in the Open Pit PFS has successfully extended the open pit mineralization. Importantly, it also highlights the need for further drilling to test the full extent of the deposit and to continue expanding and upgrading the open pit resources. The PFS proposes development of the Open Pit Project independently from the Company’s Underground Project currently under construction. The Open Pit Project was studied with a phased approach with an initial 37kstpd mining rate, with later expansion to 70kstpd. This phased development plan for the Open Pit Project yields a substantially lower upfront capital cost compared to previous studies8. This plan is aligned with the Company’s philosophy of focusing on capital efficiency and maximizing economic returns by staged development and a similar “margin-over-tons” philosophy that has been used to optimize the Underground Project. The PFS utilizes data gathered over the recent years on drilling, metallurgy, environmental design, with a focus on delivering maximum project value and economic returns. The proposed Open Pit Project plan includes additional drilling in areas that have mineralization open within the pit boundary that are currently Inferred resources, as well as areas where the boundary of mineralization remains open. 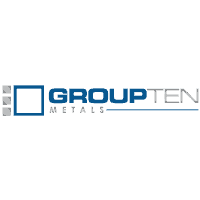 Golder Associates Ltd. (“Golder”), Sedgman Canada Limited, part of the CIMIC Group (“Sedgman”) and Tetra Tech Inc. (“Tetra Tech”) prepared the Open Pit PFS and the Technical Report, supported by the Nevada Copper project team. The Property is located within the Walker Lane mineral belt of western Nevada. Within the Property, the Western deposits, comprising the North and South deposits, represent the proposed Open Pit Project. The North deposit is a Cu-rich, magnetite-poor skarn breccia body hosted by hornfels of the Gardnerville Formation. The South deposit is a magnetite-chalcopyrite body closely associated with an intrusive contact of granodiorite into limestones of the Mason Valley Formation. The Open Pit PFS incorporated the 2015 and 2018 drilling results in the updated Open Pit resource. Both programs intersected new mineralization, successfully upgrading waste and Inferred resource material into Indicated resources. High grade mineralization was also intersected within and outside the current pit boundaries and remains open at depth, generating new underground targets. The areas of open mineralization are shown in the figure below for the North deposit. The arrows indicate the zones of mineralization that remain open and are targets for further drilling to potentially expand the mineralization boundary, as well as potentially continue to upgrade mineral categories from Inferred to Indicated mineral resources in a range of zones. The Mineral Resource estimate9 used as the basis for the Open Pit PFS is summarized below. Mineral Resources are subdivided into classes of Measured, Indicated and Inferred, with the level of confidence reducing with each class respectively. Mineral Resources are reported as in situ tonnage and are not adjusted for mining losses or mining recovery. The Mineral Resources reported are inclusive of those reported in Mineral Reserves. The reader is cautioned that Mineral Resources that are not Mineral Reserves do not have demonstrated economic viability. 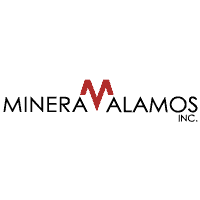 Note: Effective date of Open Pit Mineral Resource is January 21, 2019. Totals may not total due to rounding. Includes North, South and South-East deposits. Excludes materials that are oxidized, transition or volcanics. Columns using prices / recoveries: Cu $3.20/lb & 89.3%; Au $1,325/Oz & 67.3%; and Ag $20.01/Oz & 56.3%. The updated resource model has resulted in an increased amount of Inferred resource tonnage compared to previous resource estimates (please refer to footnote 7 to this press release). This material may potentially be upgraded to Indicated Resources with further technical work, but there is no certainty that Inferred resources will ever be upgraded. The tons, grades, and classification of the Mineral Reserves estimate10 in the Open Pit PFS mine plan are tabled below. 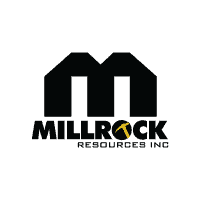 Note: Effective date of Open Pit Mineral Reserve is January 21, 2019. Inferred Mineral Resource was considered waste for the open pit reserve estimate. Calculations used price forecast/recoveries: Cu $2.75/lb & described above, Au $1,343/toz & 67%, and Ag $19.86/toz & 56%. The Open Pit Project has been designed to be a conventional truck-and-shovel operation with a combination of hydraulic and electric cable shovels and haul trucks. The Open Pit Project mineral reserves are found in the North and South deposits. 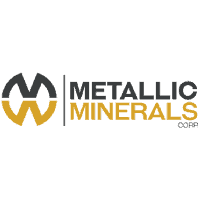 The Mine Plan has been phased and developed to minimize pre-production stripping to deliver material as soon as possible and provide an attractive life of mine grade profile of 0.50% Cu-eq (0.47%Cu) and the first five years with a grade average of 0.69% Cu-eq (0.65% Cu). Mining is planned to commence in the higher-grade North pit, with the South pit being mined after the North. Stockpiling of ore is used in the mine plan to optimize the grade profile for the mill feed. The Mine and Mill Plan produces at 37kstpd rate for production years 1 to 6, before expanding to 70kstpd rate from year 7 to 19. Material is delivered by haul truck to a primary crusher, with discharge from the crusher conveyed to a coarse stockpile adjacent to the mill. Mining is planned to be conducted using 50 ft. benches with variable inter-ramp pit slope angles (49° to 55°) depending on geotechnical domain. The PFS utilized the Geovia Whittle™ pit optimization process to define ultimate pit limits and target the most economic ore early in the mine life. Over the mine life, a total of 1,561Mst will be moved, which includes 386Mst of ore as mill feed. The mining fleet includes 320ton class trucks, loaded by 64 yd3 electric shovels, 47 yd3 diesel-hydraulic and 30 yd3 wheel loaders. Drill and blast will be undertaken with track-mounted drill rigs drilling 10¾ inch holes. Explosives are planned as down hole service by explosives supplier. Haul roads are designed to be 119 ft. wide to allow for two-way traffic at a maximum gradient of 10%. Strip ratios vary over life of mine with an average of 2.8 excluding pre-strip (3.0 including pre-strip). The Figure below illustrates a long-section of the Open Pit Project showing the ultimate pit as set out in the PFS and the resource model grades. The treatment technology proposed for the project is conventional flotation concentration. The processing plant will consist of crushing and grinding circuits, followed by a flotation process to recover and upgrade copper, gold and silver from the feed material at a daily production rate of 37kstpd for the first 6 years of production before expanding to 70kstpd for the remaining 13 years of production. Crushed material with the approximate size P80 of 6 inch will be fed to the grinding circuit via SAG Mill feed conveyor. Oversized material from the SAG Mill trommel screen will be conveyed to the pebble crusher. The pebble crusher will discharge to the SAG Mill. The product from the SAG Mill will be fed into the grinding cyclone feed pump-box, from where it will be pumped to the primary cyclone cluster. The cyclone underflow product will report via chute to the ball mill for further grinding. The cyclone overflow product with the approximate particle grind size P80 of 150 microns will report to rougher flotation. The flotation circuit will consist of roughing and two stages of cleaner flotation, with the single regrind mill being used for the fine grinding of the rougher concentrate. The copper concentrate will be thickened using a hi-rate thickener and the underflow pumped to the agitated stock tank prior to filtration, and the thickener overflow will be collected in the process water tank. The tailings will be disposed of by dry stacking of filtered tailings. The tailings will be thickened prior to the tailings filtration plant. The PFS metallurgical test work is based on a range of test work carried out during previous studies of the deposit metallurgy and additional metallurgical test work conducted during the Open Pit PFS. Isometric Illustration (Looking SE) of the Stand-alone Open Pit PFS Project. The Pumpkin Hollow site is currently accessible via an existing network of roads, designed for accommodating heavy equipment and other vehicles. Power for the Open Pit Project will be drawn from the existing network of transmission lines located adjacent to the site. The site infrastructure for the Open Pit Project will include fencing, temporary facilities, network of onsite roads, water associated infrastructure including tanks and pumps, treatment plant, 120kV line with tie into nearby high voltage infrastructure, various site buildings including truck shop, warehouse, a mine dry facility, and operations offices, as well as items such as fuel storage and distribution facility and wash bay. The Open Pit Project is estimated to provide direct employment of 400 to 500 hourly and staff personnel across the different phases of the life of mine, which would be expected to be drawn from the surrounding communities to provide support to the project. During the construction phase, the peak work force is expected to be approximately 600 to 800. The Open Pit Project construction will provide additional employment opportunities to the surrounding communities. A discounted cash flow model (economic model) was prepared to analyze project economics. The model forecasts annual cash flows over the whole Open Pit Project period, including two years of construction and 19 years of production. Mine closure costs occur during the production years as ongoing reclamation and bond costs, as well as additional closure costs and bond related reclamation credits that incur minor negative and positive cashflow after production ceases for ten years. All costs and cash flows are in nominal Q4 2018 dollars; the model excludes inflation adjustments. 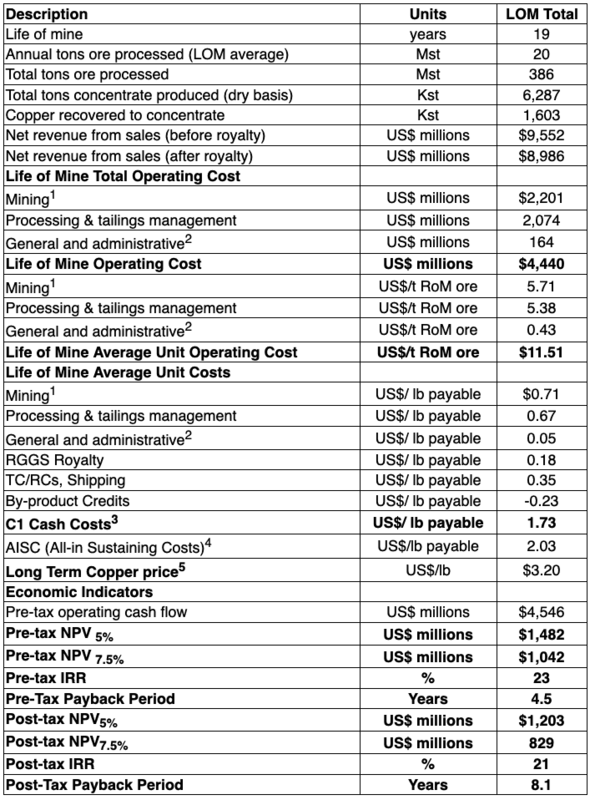 Additional operating assumptions and results from the economic model for the Open Pit Project are presented in the table below. 1 Includes mining equipment lease costs and stockpiling. Excludes capitalized waste stripping2 Includes environmental, water and other administration costs3 C1 cash costs represents cash cost from mining through to recoverable metal delivered to the market, net of by-product credits.4 AISC represents C1 Cash Costs plus taxes and sustaining capital costs.5 All prices are held constant over the producing life of the open pit mine. The economic analysis included U.S. federal income taxes estimated based on a stand-alone Open Pit Project and using recent U.S. tax reform legislation, including 21% tax rate, elimination of the Alternative Minimum Tax, and an 80% annual income limitation was applied to tax loss carry forward.A breakdown of the project capital costs is shown below. A sensitivity analysis was performed. The impacts on the results are shown in the following graphs. While the copper price change has the largest impact to the overall economic model, other inputs were tested and were shown to have a smaller impacts. Edward Minnes P.E., Golder Associates, consultant, responsible for mine planning, mine design and cost estimation. Ronald Turner, PG, Golder Associates, consultant, responsible for geology and mineral resource estimation. Aleksandar Petrovic, P.Eng. Sedgman, consultant, responsible for design and cost estimation of the mineral processing facility and associated infrastructure. Vicki Scharnhorst, PE, Tetra Tech, consultant, responsible for environmental, water management and tailings management. Nevada Copper’s (TSX: NCU) Pumpkin Hollow project is in construction with a view to the commencement of copper production in Q4, 2019. 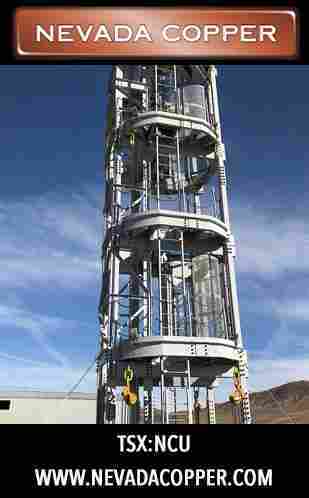 Located in Nevada, USA, Pumpkin Hollow has substantial reserves and resources including copper, gold and silver. Its two fully-permitted projects include a high-grade underground project (under construction) and a large-scale open pit project. 1 Source: Nevada Copper Pumpkin Hollow Project NI 43-101 Technical report: Pumpkin Hollow Development Options – pre-feasibility Study 5,000 tons/day Underground Project; Feasibility Study for a 70,000 tons/day Open Pit /Underground Project, amended report date of January 3, 2018. 2 Utilizes analyst consensus long-term copper price of $3.20/lb. 4 Based on 37kstpd mill feed period of copper production, after ramp-up. 5 Cu-eq. calculated using prices with process recoveries based on pit location: Cu $3.20/lb with 90% process recovery for North ore and 88% process recovery for South ore; Au $1,325/Oz & 67.3% process recovery for both North and South ore; and Ag $20.01/Oz & 56.3% process recovery for both North and South ore.
6 kstpd = thousand short tons per day. 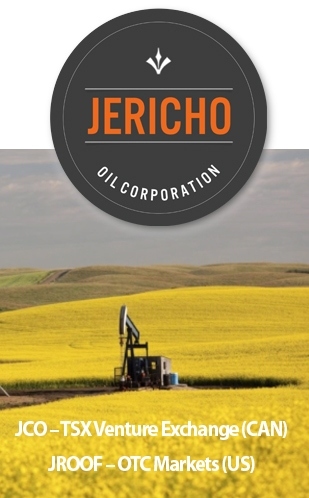 7 Economic input assumptions draw from the details provided throughout the Technical Report for each stand-alone underground and open pit component of the Property. The assumed timeline for the Underground Project assumes production commencing end 2019 and assumes Open Pit Project construction starting in 2021 with production ramping up in 2023. The results are based from a combination of production, revenue, costs and cashflows as in each stand-alone economic model. The “Combined NPVs” are the arithmetic sum of the individual case NPVs, however, note that the NPVs have differing start dates and will not match the NPV of the combined annual net cashflows. 8 Source: Nevada Copper Pumpkin Hollow Project NI 43-101 Technical report: Pumpkin Hollow Development Options – pre-feasibility Study 5,000 tons/day Underground Project; Feasibility Study for a 70,000 tons/day Open Pit /Underground Project, amended report date of January 3, 2018. Own a Piece of U.S. History Below Bullion Prices! At Miles Franklin we strive to find unique values or anomalies in our marketplace to offer our clients. Many consider the twenty-dollar gold piece designed by Augustus Saint-Gaudens to be the most beautiful U.S. Coin. MS63 (PCGS or NGC Graded) Saint Gaudens (1907-1933) at $63 over 1 oz spot gold each. MS62 (PCGS or NGC Graded) Saint Gaudens (1907-1933) at $49 over 1 oz spot gold each. Currently 1 oz Spot gold is $1275. These numismatic gold coins historically sold for 50-300% above bullion gold prices. Recently many of our clients have been exchanging bullion gold bars and coins for numismatic gold coins. This offer represents the very best opportunity to exchange or purchase outright these pieces of history. Call your broker Today or call our main line at 800-822-8080. Purchase Offer not available for Minnesota Residents. Standard insured shipping rates apply. After some dreadful timing and miscommunication to the market, shares in Miramont plummeted from $.47 a share to $.12 in two days at the end of March. The company dumped some poor results from six holes onto the market and the market gagged. But the scout program consisted of nine holes and on the 12th of April Miramont released the assays from the last three holes. 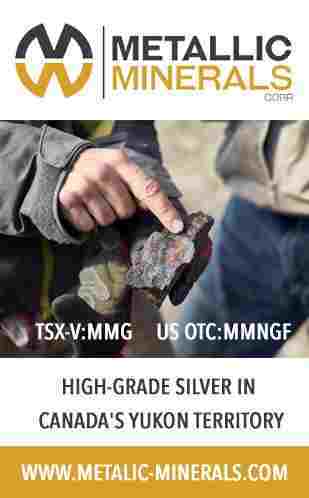 Vancouver, BC, Canada, April 17, 2019, Allegiant Gold Ltd. (“ALLEGIANT”) (AUAU: TSX-V) (AUXXF: OTCQX) reports that it has completed drilling at its Adularia Hill gold project located in Nevada. ALLEGIANT completed 21 RC holes totaling 3,170 meters at Adularia Hill; assays are pending. ALLEGIANT plans drilling at a total of six “discovery potential” projects located principally in the world-class gold mining jurisdiction of Nevada. The drilling campaign was initiated at the Red Hills project in August 2018; Adularia Hill was the 5th project to be drilled. Adularia Hill is located within ALLEGIANT’s Eastside claim block, about 12 km south of the Original Zone gold deposit, approximately 2 km north of the past producing open-pit-heap-leach Boss Mine, and some 2 km north of Castle, which hosts an historical gold resource. The Adularia Hills target was discovered during geologic and alteration mapping by ALLEGIANT followed by surface sampling of outcrop and float. ALLEGIANT collected 150 surface samples in an ovoid area about 1,400 meters by 850 meters. Thirty of the 140 samples contained gold values ranging from 0.1 to a maximum of 1.5 g/t gold. Gold occurs in and along structures and silica ribs with associated stockworks of quartz and adularia veining. The mineralized structures cut Tertiary andesite, tuffs, rhyolite plugs and flow domes, and Ordovician basement rocks. 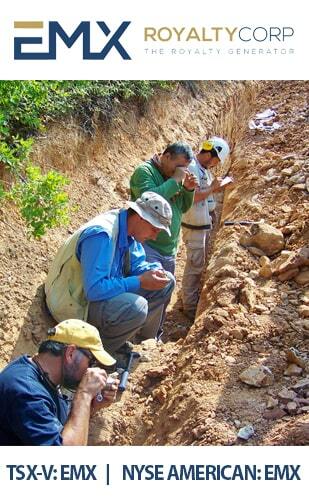 Outcrops make up about 20-30% of the target area with the rest covered by shallow alluvium. Andy Wallace is a Certified Professional Geologist (CPG) with the American Institute of Professional Geologists and is a Qualified Person as defined under National Instrument 43-101 – Standards of Disclosure for Mineral Projects. Mr. Wallace has reviewed and approved the technical content of this press release. ALLEGIANT owns 100% of 11 highly-prospective drill-ready gold projects in the United States, 8 of which are located in the mining-friendly jurisdiction of Nevada. 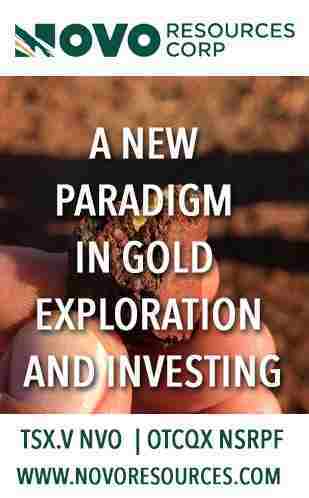 ALLEGIANT is one of the most active explorers in the gold sector; five projects with “discovery potential” have been drilled since August 2018. ALLEGIANT’s flagship Eastside project hosts a large and expanding gold resource, is district scale, and is located in an area of excellent infrastructure. Preliminary metallurgical testing indicates that both oxide and sulphide gold mineralization at Eastside is amenable to heap leaching. Certain statements and information contained in this press release constitute “forward-looking statements” within the meaning of applicable U.S. securities laws and “forward-looking information” within the meaning of applicable Canadian securities laws, which are referred to collectively as “forward-looking statements”. The United States Private Securities Litigation Reform Act of 1995 provides a “safe harbor” for certain forward-looking statements. Forward-looking statements are statements and information regarding possible events, conditions or results of operations that are based upon assumptions about future economic conditions and courses of action. All statements and information other than statements of historical fact may be forward-looking statements. In some cases, forward-looking statements can be identified by the use of words such as “seek”, “expect”, “anticipate”, “budget”, “plan”, “estimate”, “continue”, “forecast”, “intend”, “believe”, “predict”, “potential”, “target”, “may”, “could”, “would”, “might”, “will” and similar words or phrases (including negative variations) suggesting future outcomes or statements regarding an outlook. Forward-looking statements in this and other press releases include, but are not limited to statements and information regarding: Allegiant’s property holding costs savings or income generated from optioning out certain properties; Allegiant’s drilling and exploration plans for its properties, including anticipated costs and timing thereof; the potential of hosting good grade gold mineralization or expansion; Allegiant’s belief with respect to North Brown anomalies and the related transportation of mineralized fragments, including the discovery of the source of the mineralized breccia fragments; indications of mineralization that is amenable to heap leaching; Allegiant’s plans for growth through exploration activities, acquisitions or otherwise; and expectations regarding future maintenance and capital expenditures, working capital requirements; and Barrian’s plan to complete an initial public offering and its acquisition of certain properties. Such forward-looking statements are based on a number of material factors and assumptions and involve known and unknown risks, uncertainties and other factors which may cause actual results, performance or achievements, or industry results, to differ materially from those anticipated in such forward-looking information. You are cautioned not to place undue reliance on forward-looking statements contained in this press release. Some of the known risks and other factors which could cause actual results to differ materially from those expressed in the forward-looking statements are described in the sections entitled “Risk Factors” in Allegiant’s Listing Application, dated January 24, 2018, as filed with the TSX Venture Exchange and available on SEDAR under Allegiant’s profile at www.sedar.com. Actual results and future events could differ materially from those anticipated in such statements. Allegiant undertakes no obligation to update or revise any forward-looking statements included in this press release if these beliefs, estimates and opinions or other circumstances should change, except as otherwise required by applicable law. 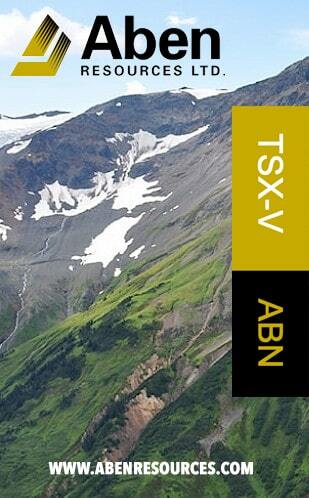 VANCOUVER, British Columbia, April 17, 2019 (GLOBE NEWSWIRE) — Novo Resources Corp. (“Novo” or the “Company”) (TSX-V: NVO; OTCQX: NSRPF) is pleased to provide an update regarding plans for the Company’s Beatons Creek conglomerate gold project and its broader East Pilbara projects (collectively the “East Pilbara gold assets”). 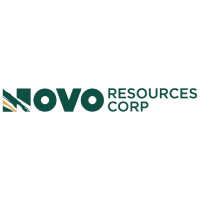 Novo recently announced a substantial resource upgrade (the “2019 Resource Estimate”) at Beatons Creek (for further details see the Company’s news release dated April 1, 2019). This increase in size and confidence of the 2019 Resource Estimate is important as it provides what the Company sees as critical mass to underpin an options study across the East Pilbara gold assets. 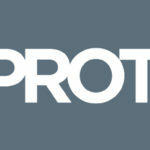 Mr Paul Henharen of Acacia Management Consultancy P/L has considerable experience in this field and has been engaged to undertake the study in conjunction with Optiro P/L. The options study is expected to be completed during the third quarter of calendar 2019 and make recommendations on project development scenarios to take forward to more detailed economic studies. Novo’s East Pilbara gold assets extend beyond the Beatons Creek 2019 Resource Estimate. 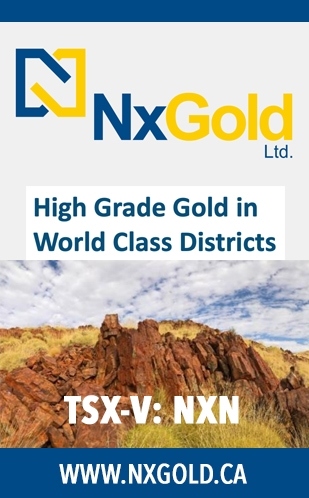 Other areas of interest include Novo’s 100%-controlled high grade Blue Spec gold-antimony deposit located 19km ENE of Nullagine (please refer to the Company’s news release dated August 17, 2015), the Talga Talga gold deposit 21km N of Marble Bar (please refer to the Company’s news release dated December 13, 2018) and an exploration pipeline of gold-bearing conglomerate prospects including Contact Creek and Virgin Creek, located 39 km NW and 27 km SW respectively from the town of Marble Bar (please refer to Figure 1 below – map of Novo’s East Pilbara prospects). Each of these prospects are earmarked for further exploration or project development expenditure during 2019. In the Company’s January 7, 2019 news release, Novo outlined an extended and expanded non-binding memorandum of understanding with Sumitomo Corporation of Tokyo, Japan involving a pre-allocated commitment of 5,000,000,000 Japanese Yen. The objective of this commitment is to provide ongoing financial support and resources to progress economic studies and develop Novo’s Australian gold projects, subject to mutual agreement on project development plans and transaction structures. Novo CEO and director Mr Rob Humphryson commented, “concurrently with our prospects at Egina and Comet Well / Purdy’s Reward around 300-400km to the west, exploration works at our East Pilbara gold assets have continued apace and have added significant value to Novo. The increase in both size and confidence of the Beatons Creek conglomerate gold resource has provided the impetus to aggressively pursue options for a standalone gold production centre in the East Pilbara. Novo remain committed to our goal of rapidly developing our gold projects and we are very excited at the prospect of returning Pilbara’s gold bearing conglomerates to production for the first time in almost 100 years”. Dr. Quinton Hennigh (P.Geo.) 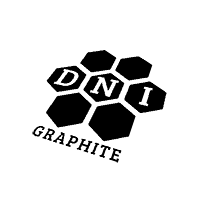 is the qualified person pursuant to National Instrument 43-101 Standards of Disclosure for Mineral Projects responsible for, and having reviewed and approved, the technical information contained in this news release. Dr. Hennigh is President, Chairman, and a director of Novo. Some statements in this news release contain forward-looking information (within the meaning of Canadian securities legislation) including, without limitation, the statements as to the Company’s planned exploration activities and the prospect of gold production from the Company’s East Pilbara gold assets. These statements address future events and conditions and, as such, involve known and unknown risks, uncertainties and other factors which may cause the actual results, performance or achievements to be materially different from any future results, performance or achievements expressed or implied by the statements. 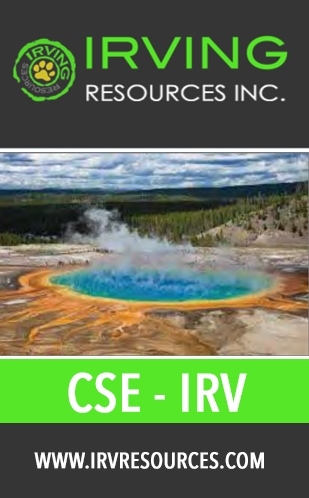 Such factors include, without limitation, customary risks of the resource industry, economic conditions and risks and uncertainties inherent to mineral resource estimates as well as the performance of services by third parties and the issuance of necessary approvals and permits by regulatory authorities. 1) Prices were stable for the one hundred years before the Federal Reserve’s “takeover” of the money supply in the U.S. The rising prices problem occurs because of Fed policies, not time. 2) The above are examples of price inflation. You can add 999 more from your personal experience. The official numbers from the government are… well… untrustworthy. 3) Prices rise more rapidly than the Humphrey Hawkins law (zero percent) specifies. 5) Congress could vote to audit the Fed. It does not. 6) Congress could demand the Fed follow law. It does not. 7) Congress could dissolve the Fed and return to a modified gold standard. This would encourage government accountability, stable prices, and decrease Wall Street’s influence over our lives and economy. For obvious reasons, it does not. Silver is inexpensive in 2019 compared to the S&P 500, national debt, and gold. Silver peaked eight years ago. Buy silver and wait. Another higher peak is coming… unless you trust central banks, politicians, governments and fiat currencies to act honestly and be trustworthy. Miles Franklin sells silver and gold. Call 1-800-822-8080 and buy metals for insurance against the lies and devaluation necessary to support an unbacked fiat currency. … or you can trust the political and financial elite to take care of your needs while they enrich themselves. 4/5 Is This Patriotism? Is This How We Make America Great Again? 4/1 How Many Times Have You Heard “You Can’t Eat Gold” As A Reason NOT To Own Gold? Miles Franklin was founded in January, 1990 by David MILES Schectman. David’s son, Andy Schectman, our CEO, joined Miles Franklin in 1991. Miles Franklin’s primary focus from 1990 through 1998 was the Swiss Annuity and we were one of the two top firms in the industry. In November, 2000, we decided to de-emphasize our focus on off-shore investing and moved primarily into gold and silver, which we felt were about to enter into a long-term bull market cycle. Our timing and our new direction proved to be the right thing to do. We are rated A+ by the BBB with zero complaints on our record. We are recommended by many prominent newsletter writers including Doug Casey, Jim Sinclair, David Morgan, Future Money Trends and the SGT Report.